NEW YORK, Sept. 17, 2018 /PRNewswire/ -- Today the ASPCA® (The American Society for the Prevention of Cruelty to Animals®) announces its first Factory Farm Detox, a week-long consumer challenge to eliminate factory-farmed products and replace them with more humane and sustainable alternatives including animal welfare verified and plant based products. The Factory Farm Detox, which runs from September 24-30, was created to raise awareness about the negative impacts of the industrial operations that raise over 95 percent of farm animals in the U.S. in inhumane conditions and help shift the market to support a more humane and sustainable food system. "We know consumers are more aware and concerned than ever about how their food is produced, and the many negative ripple effects factory farming has on animals, our environment, and human health," said Daisy Freund, Director, ASPCA Farm Animal Welfare Campaign. "However, making better food choices can feel like a solitary and small act to counter a big problem. 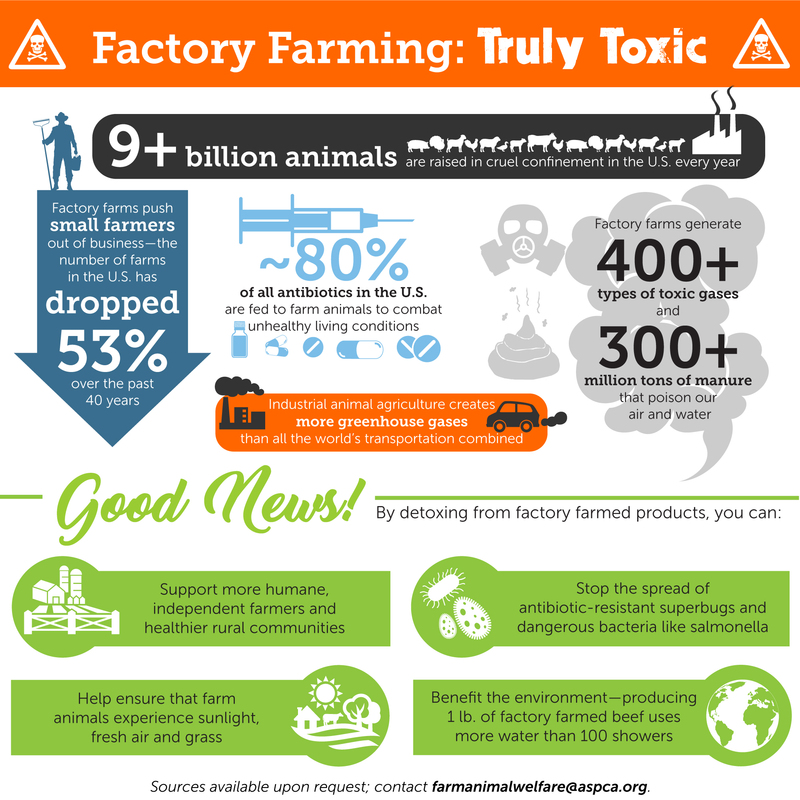 The Factory Farm Detox will build a sense of community and solidarity among this growing group of concerned consumers and reinforce that together our actions can change billions of animals' lives and help create a better, kinder food system." Participating in the Factory Farm Detox is as simple as not buying meat, eggs or dairy from animals raised on factory farms where animals are caged, crowded and lacking access to the outdoors. Instead participants can opt for plant-based food or products certified by meaningful animal welfare certifications: Animal Welfare Approved, Certified Humane and Global Animal Partnership Steps 2 and above. "Big dietary shifts can seem overwhelming," Freund said. "It is our hope that a one-week factory farmed food detox feels achievable for most people and gives them a chance to explore the more-humane food options in their local stores and restaurants and request them when necessary." Those interested in joining this week-long stand against dangerous factory farms can sign up for the Factory Farm Detox by visiting the official website at www.aspca.org/detox for more information. Graphic: The "Factory Farming: Truly Toxic" graphic can be downloaded here. Credit to ASPCA. There are now nearly 10 billion land animals raised for food in the U.S. each year, the vast majority of whom live in confinement, in facilities that do not meet their basic physical and behavioral needs. The ASPCA Farm Animal Welfare Program is committed to directing consumers, corporations and lawmakers toward solutions that will improve these vulnerable animals' lives. For more information about which food labels provide the most meaningful animal welfare standards, visit ASPCA's campaign "Shop With Your Heart."